135: Be Careful and Thankful for what you wish for…. 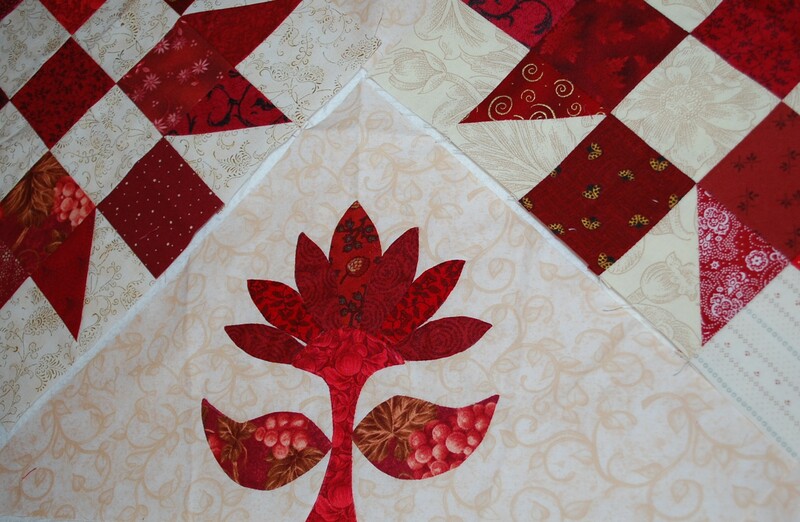 Here is the Busy Bee Raffle Quilt 2009 that I designed for our guild in rough form. Here is a detail of someone’s applique work… I am excited to be the designer of this quilt and hope it does well for our guild. Next is a gift for a holiday exchange I am enrolled in. The receiver likes the color Red…what do you think? 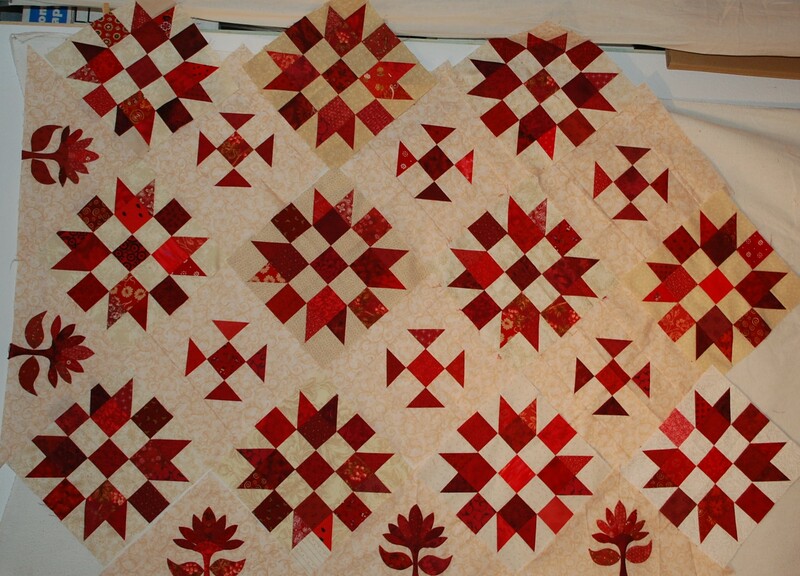 it just needs to be quilted and bound and sent off for Christmas….Can you tell it is a log cabin variation?? 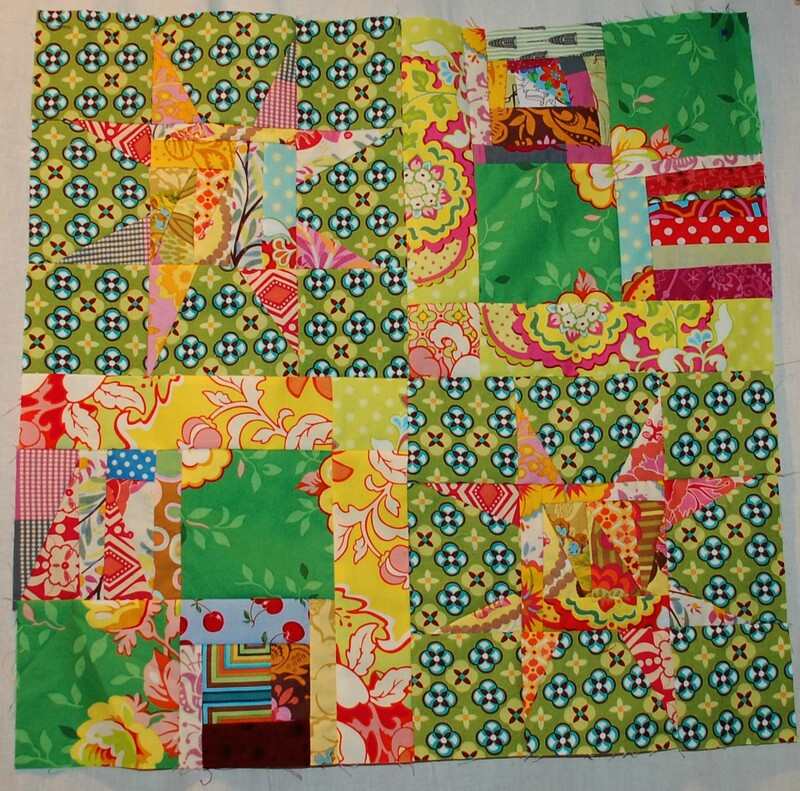 And here is the Doll Quilt Swap 5 that I am working on. I haven’t posted it much, but it is almost done…I think it needs a row of flying geese down one side… She likes green…..
And on the fabric design front….. Here is my latest design that I sent to Spoonflower…I should have a whole yard of this in a week…I am so excited about this one…very fun and Andy Wharhol-ish I think…I submitted it to a weekly contest that Spoonflower is hosting…and if I win you could buy some for yourself on Spoonflower’s Etsy site…after that you could buy it from me!! I may be selling a couple fat quarters on it our our Etsy site even if I don’t win, so you could still maybe get some…VERY limited addition fabric to be sure, but I think it is so fun! 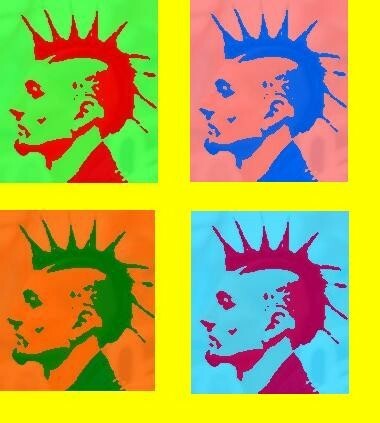 The Punks are appx 2″…..I will keep you posted. If I get selected, I will tell you so you can go vote for mine!! 🙂 When the fabric gets here, I will show you what it looks like in scale and reality. And now to get to the beginning statement in my “title” of this entry. Be careful and thankful what you wish for…cause you just might get it! I have just received another offer from Free Spirit Fabrics to design a quilt for Jay McCarroll’s new lines of fabric with them. 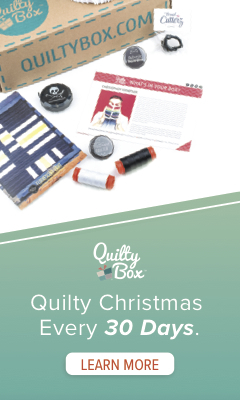 So the fabric arrives by this coming Wednesday, and they want the quilt and a pattern for their websites free pattern by the 12th of December! I am excited to do this, but also crunched for time I think. But the most exciting thing is that my quilt will be what they use in their adverisements for the lines of fabric. How cool is that? And on top of all this, the fabrics that I have requested from Free Spirit as well as Moda and Michael Miller are rolling in and I am still working on the stuff I have from this summer…I am expecting a prolific winter people! I will try to post the progress on Jay’s quilt as I go, but with the deadline and all, you may be getting the info much later than when it is happening, but you might like to see how I go about designing quilt patterns. Or at least one way I do it…I think I have different approaches everytime. I was told that it should be innovative, but not too difficult…..I am not exactly sure what that means, but I think I can do it! 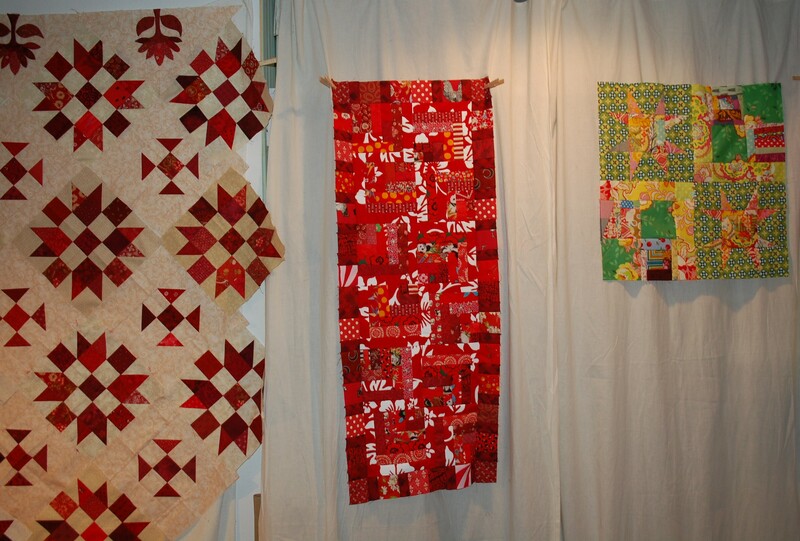 This post is so full – great quilts – great variety – great color…I love Heather Bailey! Wow, Scott, you are on a roll!! Keep it up. Love to come over and read your creative blog. Your creative energy just jumps right off the page! Oh Sandi, thanks for the wonderful compliment!